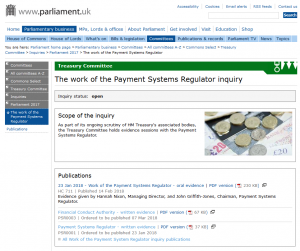 Based on research we carried out for Project Carlton and communications via our constituency MP, we made a submission on NPSO’s proposed “Confirmation of Payee” service and on Authorised Push Payment Fraud, and into the Treasury Select Committee for their inquiry into the work of the Payment Systems Regulator. Shortly afterwards both NPSO and the Payment Systems Regulator issued statements on the same subject, and we made a short supplementary submission. In the main subission we drew attention to our having consistently pointed out the divergence between the PSR’s plans and actions, and the actual problems besetting the UK payments landscape. We stated our belief, and provided evidence to back it, that the action plan and proposed solutions to Authorised Push Payments Fraud (“APP Fraud”) as presented by the PSR in oral evidence to the Treasury Select Committee in early 2018 would either not be solutions, or would arrive far later than the PSR has represented. In particular “Confirmation of Payee” was unlikely to be available in proper production before 2025 if it was an “overlay service” on top of New Payments Architecture, and all UK Payment Service Providers needed to be reachable through it for it to have any value. The supplement addressed statements made both by NPSO and by the PSR shortly afterwards, and in particular the PSR’s stated intention of consulting by December 2018 on issuing a General Direction that “Confirmation of Payee” become available by July 2019. The previous exchange between the Treasury Select Committee and the PSR on the subject had concluded with the PSR agreeing to “take action” and before the end of 2018 if “Confirmation of Payee” had not become available in 2018 in line with the plan that the PSR had told the committee existed. The implementation will fall on the same applications that are being adapted to comply with 2017 Payment Services Regulations (i.e. with EBA RTS on SCA and CSC) by September 2019.